Here’s yet another cruel blow to President Obama’s signature health care law as we close out 2013 and head into 2014: More than 4 in 10 Americans, if they had their way, do not want to hear the word “Obamacare” uttered in their presence next year. In short, they’re sick of health reform news. What’s also clear is that voters are sick of bad news from the federal government – especially at what’s supposed to be a joyful time of year. The results are reported in a new Marist poll conducted between Dec. 3 and Dec. 5. Nearly 1200 adults were surveyed by telephone. Budget speak doesn’t fare well either. Thirty percent of respondents said they’d rather not hear the word “shutdown” next year – while another 11 percent are pleading with Congress to please not bring up the word “gridlock” next year. Naturally, there’s some political preference when it comes to the least favorite terms. Nearly 60 percent of Republicans would defund the word “Obamacare,” while 45 percent of Democrats “cringe at the sound of ‘shutdown.’” The poll was comprised of a split sample of registered voters. 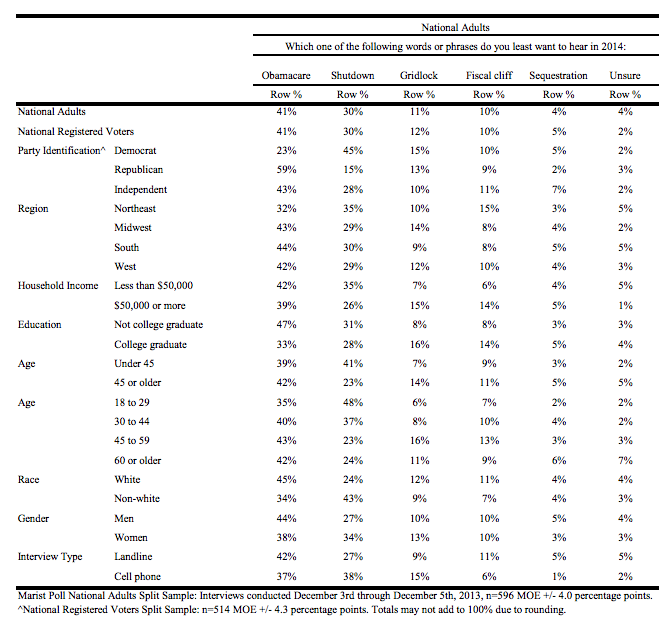 You can see the results in detail in the table from the Marist poll here.